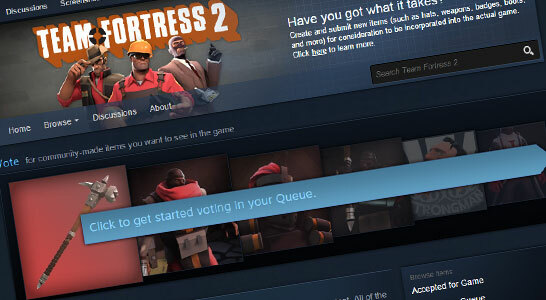 The TF2 Workshop now has a voting queue! The upgraded queue should make it a lot easier for you to discover new and interesting items to vote on, and will help us get a broader sense of which items you most want to see in-game. The TF2 Workshop home page has also gotten a redesign. It should now be much easier to browse through new items created by authors you follow, see what your friends are marking as favorites, and read about recent Workshop news from the TF2 team. Workshop authors: Be sure to mark your sets as "sets" in the "edit collection" page, since this will change how your items are now showcased! One last reminder: Don't forget to vote on Tomb Raider items, now available in a handy new landing page thanks to the redesign.